Brzeziny, Poland is 12 miles east of Lodz, and its prewar Jewish population stood at 6,850. The Jews were herded into a ghetto in April 1940, where they suffered starvation, cold, disease, selections for forced labor, and punishment and torture by the Nazis. On Purim 1942, the Nazis ordered that 10 Jews were to be hanged publicly as punishment for the continuous smuggling that was needed to keep people alive. When the ghetto was liquidated May 14-15, 1942, screaming mothers were separated from their children, who were among the 1,700 residents deported to the Chelmno extermination camp. Most of the remaining Jews were sent to the larger Lodz Ghetto and some were selected for forced labor elsewhere. Brzeziny is just one of more than 1,150 Eastern European ghettos described in painstaking detail in “Encyclopedia of Camps and Ghettos, 1933-1945: Volume II, Ghettos in German-Occupied Eastern Europe,” published by the U.S. Holocaust Memorial Museum (USHMM) with significant funding from the Claims Conference. Volume I, “Early Camps, Youth Camps, and Concentration Camps and Subcamps under the SS-Business Administration Main Office (WVHA),” examined 110 early camps and 24 main concentration camps. The remaining planned five volumes of the Encyclopedia will be published over the next decade. The Claims Conference has worked closely with the USHMM for a number of years on this groundbreaking endeavor. 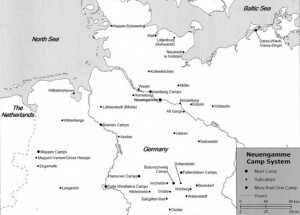 The project, in total and through the eventual publication of seven volumes, has revealed more than 42,000 camps and ghettos throughout Nazi-occupied and Nazi-allied Europe and North Africa, more than twice the number that researchers believed they would document when the USHMM first approached the Claims Conference in 2007 for funding. The Claims Conference is proud to have been an early supporter of this landmark project. We have helped bring about the restitution of history, attempting to ensure that every site of Nazi incarceration and extermination will be documented for all time. Without this project, public knowledge of the extent of the Nazi system would be vastly incomplete. With the Encyclopedia, all sites of imprisonment and extermination will now be recorded; their victims deserve no less. “The Museum’s multi-volume ‘Encyclopedia of Camps and Ghettos,’ which brings together the efforts of over 400 researchers from around the world, is a massive undertaking. It is bringing to light new understanding of the Holocaust and provides survivors with renewed assurance that their experiences will never be forgotten. The project would not be possible without the extraordinary support of the Claims Conference, which shares our dedication to ensuring the permanence of Holocaust memory and achieving dignity and justice for Holocaust survivors,” said Sara J. Bloomfield, Director of the USHMM. Equally as significant as the number of entries is the level of detail in which each one is described and the accompanying heartbreaking photos, turning what could have been a very academic project into a catalog of every human horror beyond imagination. 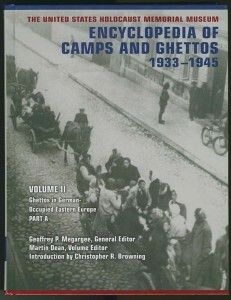 The United States Holocaust Memorial Museum Encyclopedia of Camps and Ghettos 1933–1945, Vol I, Geoffrey P. Megargee, ed. (Bloomington: Indiana University Press, 2009). The research undertaken over the past years in order to be able to publish the Encyclopedia also served as a resource to the Claims Conference in discussions with the German government. Proving incarceration in camps, sub-camps, satellite camps and ghettos that were smaller, lesser-known, or documented only in long-ignored archives can be extremely challenging, especially for elderly survivors or even their families. Over the years, the research has helped in our ongoing negotiations with the German government regarding survivor eligibility for compensation payments. For the first time, the Encyclopedia brings together, for the public at large, information that until now has been scattered through millions of pages of published and archival material in numerous languages. More than 400 contributors are involved in the project, in addition to the small USHMM staff that oversees it.